At Rick Wershe’s one and only parole hearing in 2003 the only seemingly substantive evidence against him was presented by two agents from the Drug Enforcement Administration—the DEA. Three DEA investigative documents were presented to the parole board as proving Wershe was a drug lord, a kingpin. Last August Informant America documented flaws and outright falsity in two successive blog posts. It’s time to take a look at the third one. Last August Informant America documented in a pair of blog posts why the menace-to-society claim against Richard J. Wershe, Jr. was and is totally false. But there were distractions. For a time there appeared to be a chance that Rick Wershe was at long last going to be released from prison. But Wayne County Prosecutor Kym Worthy fought like hell in the courts to keep him in prison. She did this even though her office admitted officially in response to my Freedom of Information Act request for the documents to support the smear against Wershe that they have no records—none—to support earlier allegations from her office that Wershe was the leader of a murderous drug organization that reigned supreme in Detroit’s drug underworld in the late 1980s. Informant America has argued there appears to be an official vendetta against Rick Wershe, crazy as it may sound. In the 1980s he was a white kid in a mostly black neighborhood who dared to become a paid FBI secret informant against a black drug gang tied to Detroit Mayor Coleman Young through marriage. Wershe wound up sleeping with the mayor’s niece and he helped the FBI prosecute the mayor’s brother-in-law in a major drug case. For good measure, he told on corrupt cops, too. Since then the “system” has gone to great lengths to keep him in prison, no matter how much the laws have changed, no matter how many years he has served. In the blog posts RickWershe and the DEA’s informant problem and a follow-up, Did a DEA agent mislead the Parole Board about White Boy Rick, we saw how a key DEA snitch who made accusations about Rick Wershe was so outrageously unreliable the Detroit U.S. Attorney’s office prosecuted the informant for perjury—lying under oath—and won a conviction. 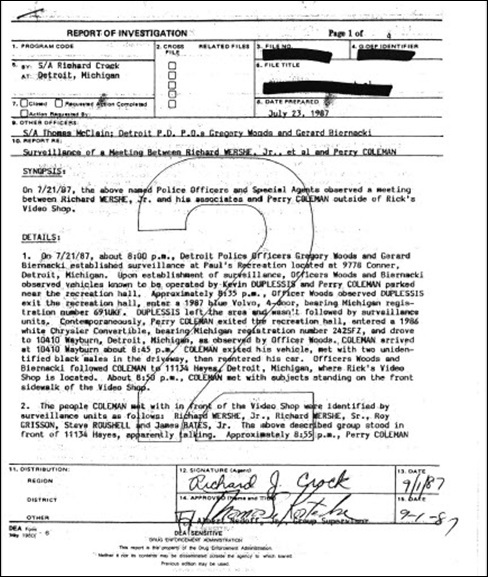 Yet DEA special agent Richard Crock presented this convicted liar’s “debriefing” statement to the Michigan Parole Board as if it came from a reliable informant. In another blog post, Key‘Witness’ against Wershe denies DEA ‘Lies’, Roy Grisson, Rick Wershe’s one time pal, said the DEA and Detroit Police narcs tried to “sweat” admissions out of him after kidnapping him from a hospital where he was recovering from gunshot wounds from an attempted robbery. The DEA and DPD narcs would later say it was an attempted hit ordered by Rick Wershe. Grisson wouldn’t tell them what they wanted to hear so they dumped him on a downtown Detroit street. Grisson says he’s prepared to testify under oath that the DEA report of his “debriefing” is a fabrication and that any document with his signature is a forgery. The “debriefing” of discredited informant Terry Colbert and the “debriefing” of Roy Grisson were two of three DEA investigative reports presented to the parole board as “evidence” against Rick Wershe. In this post we will explore the third and final piece of documentation that purports to prove Rick Wershe’s status as a major domo in Detroit’s drug underworld. A DEA “6” is the form number for their investigative reports. This one deals with a purported surveillance that took place on the night of July 21, 1987. As we will see, there are reasons to wonder if these events really happened. 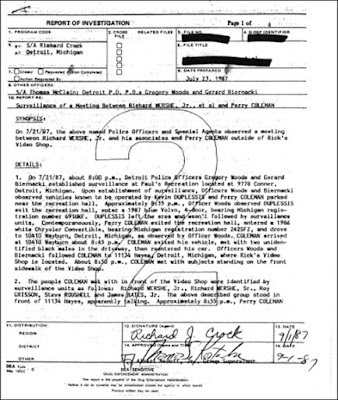 The report says Detroit Police narcs Gregory Woods and Gerard “Mick” Biernacki were conducting a vehicle surveillance with DEA Special Agent Richard Crock. They liked to call themselves the No Crack Crew. This DEA-6 report was given to the Michigan Parole Board as part of the evidence that Rick Wershe is a menace to society. They were watching Kevin Duplessis and Perry Coleman, two of the key suppliers of cocaine to the infamous Chambers Brothers who truly were drug barons in that era. The cops followed Duplessis and Coleman from a pool hall to Rick Wershe’s Video shop on Hayes Street on Detroit’s east side. Rick Wershe tells me his video shop was popular with everybody in the ‘hood because it was the only one in that part of the ghetto.He emphasizes he never did any drug business with Perry Coleman. Knowing the guy is not the same as conspiring with him in a criminal enterprise. “Even Demetrius Holloway would come in to rent movies,” Wershe recalls. In that era the late Holloway was regarded by many as the godfather of all dope dealers in Detroit. Holloway was murdered execution-style while buying a pair of socks in a clothing store about a block from Detroit Police Headquarters. The surveillance report goes on to say Perry Coleman met with Rick Wershe, his dad, his friend Roy Grisson and the owner of a car cash named James Bates, Jr. and Steve ROUSHELL. This is blunder # 1 in the DEA report. Wershe’s close friend and business partner in the drug game was the late Steve ROUSELL, not ROUSHELL. Yet the report refers to Rousell as ROUSHELL several times, indicating it wasn’t just a typo. The DEA-6 repeatedly lists Rick Wershe's close friend Steve Rousell as Steve ROUSHELL. It wasn't a one-time typo. DEA agent Crock repeatedly mis-typed the name of one of Rick Wershe's close associates. This kind of mistake can and would be challenged in court by a defense attorney as an indication of the unreliability of the report and its writer. Now, let see: if Rick Wershe, Jr. was a drug kingpin, if he had a “gang” one would think the DEA agent trying to make a case against him would know that his crime partner’s name was Rousell—not Roushell. This is fundamental to building a criminal conspiracy case; knowing the names of the suspected conspirators. Crock got it wrong but passed this report along to the Parole Board as part of the opposition to releasing Wershe from prison. The surveillance report says Steve “Roushell”, Richard Wershe, Sr. and Dawn Wershe all left the video store location. It states Wershe, Grisson and another man named Anthony McGee drove off in two vehicles toward Interstate 94. What follows is a major mistake. Which way is up? This line in the DEA report of the surveillance of Rick Wershe and some associates indicates the narcs may not know the answer to that question. Whoa! What’s wrong with this picture? Any Detroiter would have the answer in an instant. The DEA report has them going in the wrong direction for their destination. If you go south on Hayes Street to I-94 and you head East you will wind up in St. Clair Shores or Mt. Clemens or eventually Port Huron. Rick Wershe and his associates traveled from Hayes St. on Detroit's East side to San Juan St. on Detroit's Northwest side. The DEA report states they traveled East. If they did they would have wound up in another city, not Detroit. San Juan Street is on Detroit’s NORTHWEST side. They would have to go west if they were driving to San Juan Street in Detroit. This is a pretty big, sloppy error in Crock’s report. It doesn’t stop there. The DEA report claims Wershe and his associates "averaged" 90 MPH traveling to Detroit's Northwest side. That is a suspicious assertion for several reasons. “Both vehicles traveled at “average” speeds of 90 MPH.” Oh yeah? How would narcs in unmarked police surveillance cars know this unless they put the public at risk by traveling the same speed to clock the cars they were pursuing? Agent Crock’s surveillance report states Wershe and his cohorts arrived at 19300 San Juan at about 9:50 p.m. This makes no sense. I personally drove the route described in Crock’s DEA-6 and I can tell you at that time of night you could comfortably make it from 11134 Hayes Street to 19300 San Juan Street in 20 minutes with excessive speeding. If you drove at “average” speeds of 90 MPH you would arrive sooner than the report states--if you didn't get in a collision on congested 7 Mile Rd. Before proceeding, it should be noted 19300 San Juan is the home of Juanita Volsan, the sister of the late Mayor Young. Rick Wershe, Jr. was having a fling at the time with her daughter, Cathy Curry. A narc claiming to see Rick Wershe, Jr. enter the home of Juanita Volsan, the sister of Detroit Mayor Coleman Young, implies she was stashing drug profits for Wershe. There was no raid on Volsan's home after this observation so this smears Ms. Volsan without a shred of evidence, and would have the reader believe Rick Wershe raced across town at 90 MPH with two shopping bags full of cash in his car, just inviting a police search if they were stopped for reckless driving. So Juanita Volsan gets smeared by innuendo without a shred of evidence. This implies her home is a stash house for Rick Wershe’s alleged drug profits. Wershe had two FULL shopping bags. Full of what? We don’t know and neither do the cops running the surveillance. Rick Wershe insists Juanita Volsan had nothing to do with the illegal drug business even though her daughter favored dating drug dealers and her husband, Willie Clyde Volsan was himself a major drug dealer who was eventually convicted with Rick Wershe's help. Wershe makes another point about why the DEA surveillance report given to the Michigan Parole Board flunks the common sense test. “If we had two shopping bags full of money in the car with us would we be driving 90 miles an hour and risk getting stopped by the cops who might do a car search?”, he asks. Permit me to speculate about this document. I want to emphasize this is speculation. It may be that this “surveillance” report was cooked up a few days before Rick Wershe’s 2003 hearing and was not written in the summer of 1987 as the report date suggests. We know the Wayne County Prosecutor’s office had selected ranking officers of the Detroit Police Department scrambling to find dirt on Wershe quickly in the days before the public hearing. Retired Detroit FBI agent John Anthony recalls now-retired Detroit Police Commander Dennis Richardson called him and seemed “frantic” to get his hands on files about Wershe. Anthony gave him a stack of newspaper clippings; no FBI files. The newspaper clippings were given to the Parole Board at the hearing as more “evidence” against Rick Wershe. Thus, it is entirely possible that the DEA-6 report 1) linking Wershe to Perry Coleman, a major cocaine supplier for the Chambers Brothers drug gang and 2) darkly noting he carried two “full” white shopping bags in to the home of the sister of the mayor of Detroit and implying it may have been illegal drug proceeds may have been cobbled together in a big hurry in order to present it to the Parole Board as “evidence” that Rick Wershe is a menace to society. As reported in the blog posts mentioned earlier, every single piece of “evidence” given to the Parole Board by DEA agent Crock and another agent named Greg Anderson, is suspect and should be challenged in a legal forum. The Parole Board itself, if it is operating and on the up and up in Wershe’s case, should insist on a full airing of the facts and challenges to past assertions. But as Wershe’s attorney Ralph Musilli notes, no one in the system wants to put a stick of dynamite under THAT manure pile. So Rick Wershe continues to spend his life in prison while others similarly charged have been set free. He crossed the wrong people.